Objective To examine real-world treatment patterns of lipid-lowering treatment and their possible associated intolerance and/or ineffectiveness among patients with type 2 diabetes mellitus initiating statins and/or ezetimibe. Research design and methods Adult (aged ≥18 years) patients diagnosed with type 2 diabetes who initiated statins and/or ezetimibe from January 1, 2007 to June 30, 2011 were retrospectively identified from the IMS LifeLink Pharmetrics Plus commercial claims database. Patients were further classified into 3 high-risk cohorts: (1) history of cardiovascular event (CVE); (2) two risk factors (age and hypertension); (3) aged ≥40 years. Patients had continuous health plan enrolment ≥1 year preindex and postindex date (statin and/or ezetimibe initiation date). Primary outcomes were index statin intensity, treatment modification(s), possible associated statin/non-statin intolerance and/or ineffectiveness issues (based on treatment modification type), and time-to-treatment modification(s). Analyses for each cohort were stratified by age groups (<65 and ≥65 years). Results A total of 9823 (history of CVE), 62 049 (2 risk factors), and 128 691 (aged ≥40 years) patients were included. Among patients aged <65 years, 81.4% and 51.8% of those with history of CVE, 75.6% and 44.4% of those with 2 risk factors, and 77.9% and 47.1% of those aged ≥40 years had ≥1 and 2 treatment modification(s), respectively. 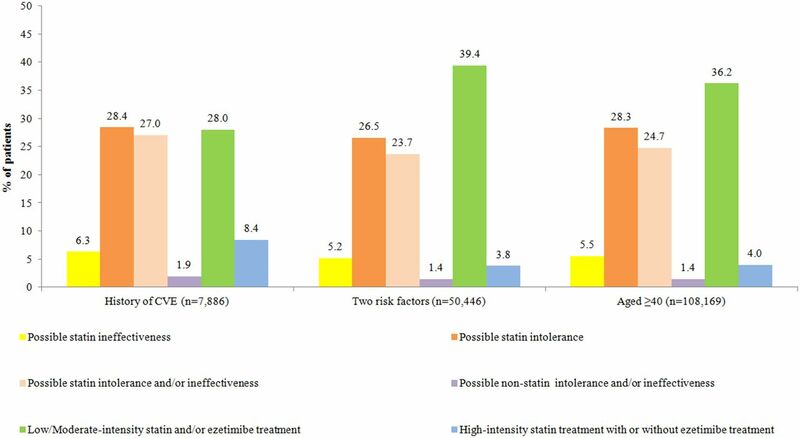 Among all patients, 23.2–28.4% had possible statin intolerance and/or ineffectiveness issues after accounting for second treatment modification (if any). Conclusions Among patients with type 2 diabetes with high cardiovascular disease risk, index statin treatment modifications that potentially imply possible statin intolerance and/or ineffectiveness were frequent. Among patients with type 2 diabetes with high cardiovascular disease (CVD) risk, index statin treatment modifications that potentially imply possible statin intolerance and/or ineffectiveness were frequent. Low use of high-intensity statin found in this study also indicates gaps in the management of hyperlipidemia among patients with type 2 diabetes and possible remaining unaccounted lipid residual risk. Better management of these patients with diabetes is warranted to reduce their CVD risk. Cardiovascular disease (CVD) is a primary cause of mortality and morbidity among patients diagnosed with type 2 diabetes mellitus.1 Patients with type 2 diabetes have a twofold to fourfold higher risk of cardiovascular events (CVEs) than patients without diabetes.2 In addition, type 2 diabetes patients with a history of CVD have an increased risk of recurrent events. Hence, high-risk patients with type 2 diabetes should be treated effectively to better manage cardiovascular risks. Despite the efficacy of statins reported in many studies, not all patients, based on their risk, can adequately control their low-density lipoprotein cholesterol (LDL-C) with the starting statin dose; therefore, treatment regimens may be modified. These modifications may include dose escalation, switches to different LLT agents, or augmentation with other LLTs.9 Some treatment modifications may potentially be indicative of statin intolerance and/or ineffectiveness. There are no standardized definition or Food and Drug Administration (FDA) diagnostic criteria for statin intolerance.10 Typically, it is defined as the inability to use statins because of significant symptoms (muscle myalgia and gastrointestinal side effects) or elevated creatine kinase levels.10 Several national and international professional medical societies recommend rechallenge of statin treatments and/or switching to other LLT as possible management options for statin-associated muscle symptoms.11–15 The AHA/ACC 2013 guidelines indicate that therapy ineffectiveness is a less-than-anticipated therapeutic response to statin therapy in which upward titration of statin dose or combination therapy is considered.11 Statin treatment intolerance and/or ineffectiveness in the type 2 diabetes population could potentially result in residual elevated risk for costly CVEs. This study examined LLT modifications among high CVD risk patients with type 2 diabetes initiating statins and/or ezetimibe. This study also investigated how such modifications may be associated with possible treatment intolerance and/or ineffectiveness issues. Eligible patients were diagnosed with type 2 diabetes (International Classification of Diseases, Ninth Revision, Clinical Modification (ICD-9-CM) codes are provided in online supplementary appendix A) aged ≥18 years with >1 outpatient pharmacy claims for statins and/or ezetimibe from January 1, 2007 to June 30, 2011 from the IMS LifeLink PharMetrics Plus data set. The initiation date of the first statin and/or ezetimibe was designated as the index date. The first statin associated with the index date was designated as the index statin. The second outpatient pharmacy claim for statins and/or ezetimibe had to be ≤6 months apart. All patients were required to have continuous health plan enrolment for ≥12 months preindex date (baseline period) and 12 months postindex date. The follow-up period for treatment patterns varied in length, from (and including) the index date to the end of continuous health plan eligibility or to the end of the study period (June 30, 2012), whichever occurred first. Aged ≥40 years: Patients aged ≥40 years on the index date. This cohort includes a broader group of patients with type 2 diabetes but also encompasses patients in the two risk factors cohort. Demographic and clinical characteristics of patients in each cohort were examined. Initial statin intensity (low, moderate, high) was also recorded and stratified by index year for each cohort. Using average daily dose, definitions of different statin intensities were adapted from the 2013 ACC/AHA guidelines (see online supplementary appendix B). The average daily dose was defined as the strength of the statin multiplied by the dose quantity and divided by the total days of supply. Treatment modification (none, first, and second) and time-to-treatment modification (days) during the follow-up period were captured. Treatment modifications are defined in table 1. Treatment modifications included dose escalation, dose reduction, augmentation, subtraction for patients receiving combination therapy, reinitiation of index therapy, switching, and permanent LLT discontinuation. Utilizing treatment modifications observed in claims data, patients with a first and/or second treatment modification were classified as possible statin intolerance, LLT intolerance, and statin/LLT intolerance and/or ineffectiveness (table 2). For example, statin dose reduction and temporary discontinuation followed by reinitiation of the same statin were considered as a signal for possible LLT intolerance.7 ,19 LLT ineffectiveness, as used in the present study, was defined in a similar way as the AHA/ACC 2013 guidelines (ie, a less-than-anticipated therapeutic response), and treatment modifications like dose escalation and augmentation with a non-statin LLT were considered as possible signals for LLT ineffectiveness. To increase the likelihood that the treatment modification(s) are associated with treatment intolerance and/or ineffectiveness, we categorized and accounted for both the observed first and second treatment modification(s) (if any), into possible LLT intolerance and/or ineffectiveness issues, as defined in table 2. Patients with no treatment modification or those who had a first treatment modification but no second treatment modification were classified into low-intensity/moderate-intensity statin and/or ezetimibe or high-intensity statin treatment with/without ezetimibe treatment depending on their statin intensity and/or ezetimibe treatment. All measures, including patients’ demographic and clinical characteristics, LLT treatment modification patterns and possible associated intolerance and/or ineffectiveness issues among the three cohorts were reported. Analyses for each cohort were stratified by age groups (<65 and ≥65 years) to investigate the impact (if any) of Medicare eligibility; since patients aged ≥65 years are primarily insured under Medicare Advantage. In addition, the Deyo-Charlson comorbidity index score was calculated for each patient; this widely published comorbidity index uses ICD-9-CM codes in claims databases to measure the severity of patients’ comorbidities.20 Means and SDs were reported for continuous variables. Relative frequencies and percentages were calculated for categorical data. All analyses were performed with SAS, V.9.3 (SAS Institute Inc, Cary, North Carolina, USA). A total of 6 063 446 patients had >1 pharmacy claim for statins and/or ezetimibe from January 1, 2007 to June 30, 2011 (see online supplementary appendix C). After applying inclusion and exclusion criteria, 136 854 patients were diagnosed with type 2 diabetes during the baseline period. These patients were further categorized into history of CVE cohort (n=9823), two risk factors cohort (n=62 049), and aged ≥40 years cohort (n=128 691; see online supplementary appendix C). The average patient age of the history of CVE and two risk factors cohorts was 59 years, whereas the aged ≥40 years cohort's average patient age was 57 years (table 3). Most patients in all three cohorts were men (history of CVE: 65.7%, two risk factors: 61.8%, aged ≥40 years: 55.4%). The majority of patients resided in the West or Northeast US regions and received coverage under preferred provider organization health plans. The mean (±SD) Deyo-Charlson comorbidity index score for patients in the history of CVE cohort was 3.2 (±1.9), two risk factors cohort was 1.6 (±1.2), and aged ≥40 years cohort was 1.8 (±1.4). Hypertension was the most common baseline comorbidity among patients in all three cohorts (table 3). More than 80% of patients in all three cohorts were aged <65 years (history of CVE: n=7886 (80.3%); two risk factors: n=50 446 (81.3%); aged ≥40 years: n=108 169 (84.1%)). Study results for those aged <65 years are reported below; similar patterns were also observed for patients aged ≥65 years. Among patients aged <65 years in all three cohorts, 65.6–77.6% of patients initiated on a moderate-intensity statin and 7.7–25.2% initiated on a high-intensity statin; a similar trend was observed each year from 2007 to 2011. Figure 1 shows the percentage of patients with an initial treatment modification or no modification for all three cohorts, among patients aged <65 years. Of those, 81.4%, 75.6%, and 77.9% in the history of CVE, two risk factors, and aged ≥40 years cohorts, respectively, had at least one treatment modification. Reinitiation was the most frequent first treatment modification among patients in all three cohorts (history of CVE: 20.5%, two risk factors: 25.1%, aged ≥40 years: 26.0%) followed by switches to a non-index statin (history of CVE: 17.5%, two risk factors: 12.8%, aged ≥40 years: 13.4%). Similar treatment trends among patients aged ≥65 years are available in online supplementary appendix D.
First treatment modification among patients with type 2 diabetes at high risk for cardiovascular events (CVEs; aged <65 years). The average number of days to the first treatment modification among patients in all three cohorts ranged from 131 to 394 days. Among all cohorts, the average time-to-reinitiation was the longest (>1 year) whereas time-to-augmentation (<5 months) was the shortest. In the history of CVE, two risk factors and aged ≥40 years cohorts, 51.8%, 44.4%, and 47.1% of patients aged <65 years, had at least a second treatment modification, respectively. Among those, reinitiation was the most common second treatment modification (history of CVE: 12.9%, two risk factors: 13.8%, aged ≥40 years: 14.8%). The average number of days from the index date to the second treatment modification across all three cohorts ranged from 379 to 607 days. Based on the first and second treatment modification(s) (if any), possible LLT intolerance and/or ineffectiveness issues, as defined in table 2, were characterized. In the history of CVE, two risk factors, and aged ≥40 years cohorts, 28.4%, 26.5%, and 28.3% were classified as having possible statin intolerance, respectively (figure 2). Possible statin ineffectiveness was observed among 5.2–6.3% of patients in all three cohorts. Also, possible statin intolerance and/or ineffectiveness issues were associated with 23.7–27.0% among patients in all three cohorts. Possible non-statin intolerance and/or ineffectiveness issues were observed among 1.4–1.9% of patients in all three cohorts. Similar treatment trends among patients aged ≥65 years are available in online supplementary appendix E.
Intensity of statin treatment and possible lipid lowering treatment intolerance and/or ineffectiveness issues among patients with type 2 diabetes (aged <65 years) at high risk for cardiovascular events (CVEs) with or without treatment modification(s). Note: Colors denoting different categories in table 2 correspond to the different colors used in this figure. This is one of the first studies to utilize a real-world retrospective claims-based analysis to associate observed LLT modification(s) (if any) with possible treatment intolerance and/or ineffectiveness among patients with type 2 diabetes with high CVD risk. Our study showed that more than 70% of patients initiating statin and/or ezetimibe treatment had at least one treatment modification and more than 35% had at least two treatment modifications, implying that many patients initiating statin and/or ezetimibe experienced issues with their index and first treatment modification during the study period. As defined and categorized in our study, these treatment modification(s) are associated with >23% of patients having possible statin intolerance and possible statin intolerance and/or ineffectiveness issues after accounting for the second treatment modification (if any). ADA 2015 Standards of Care position statement recommended the need for high-intensity statin treatment for patients with type 2 diabetes with history of overt CVD.8 Although patients diagnosed with type 2 diabetes represent a high-risk group (including all 3 cohorts in the present study), <26% across all three study cohorts were prescribed high-intensity index statins from 2007 to 2011. The low initiation rate of high-intensity statin among high CVD risk patients with type 2 diabetes suggests the need for better LLT management within this patient population. Additional research should utilize contemporary data to further understand the effects of the introduction of current guidelines. Previous studies of statin treatment patterns have focused on monotherapy, adherence or post-therapeutic substitution.32–34 Simpson et al22 concluded that high CVD risk patients were usually initiated on moderate-intensity statin which was similar to our findings, but, unlike our study which included combination treatment, Simpson's study was based on initiation of statin monotherapy. Harley et al34 followed patients after they were switched from simvastatin to other statins or combination of simvastatin and ezetimibe and found that most patients switching from higher doses of simvastatin switched to fixed-dose combination of simvastatin plus ezetimibe. However, none of these studies have put treatment modifications into perspective by critically analyzing and providing detailed classification of treatment modification and possible associated statin intolerance and/or ineffectiveness issues. To our knowledge, there is currently no existing validated claims-based algorithm to identify statin intolerance and/or ineffectiveness issues among patients. Nevertheless, statin intolerance management, based on LLT modifications, have been mentioned in national and international guidelines.11–14 The National Lipid Association defines statin intolerance as a clinical syndrome characterized by the inability of a patient to tolerate statin therapy with statin challenge of ≥2 different statins.35 As part of the 2015 comprehensive diabetes management algorithm, the American Association of Clinical Endocrinologists/American College of Endocrinology recommends ‘try(ing) alternate statins, lowering statin dose or frequency, or adding non-statin LDL-C lowering therapies’ for statin intolerant patients.15 For patients showing symptoms of statin intolerance, the ACC/AHA,12 European Atherosclerosis Society,11 and Canadian Working Group Consensus14 also recommended similar LLT modification (eg, rechallenge, dose reduction, switch to other LLT). Based on these guideline definitions/recommendations, the present study utilized treatment modifications (eg, dose reduction, reinitiation) to connote possible statin intolerance and ineffectiveness. While adapting the mentioned statin intolerance treatment management recommendations, our claims-based analyses precluded us from providing definite reasons regarding treatment modifications. However, while accounting for up to two treatment modifications, our study results are indicative of possible associated statin intolerance and/or ineffectiveness among patients included in study. We acknowledge that treatment modifications (or the lack of modification) may also be due to unobserved factors (eg, health system changes, modification in health plan formulary coverage, physician/clinical inertia). Further research (eg, the clinical chart review) is warranted to confirm our findings and explore causal links between statin intolerance and/or ineffectiveness with specific LLT modifications to provide more definite conclusions. Among patients with type 2 diabetes with high CVD risk, index statin treatment modifications that potentially imply possible statin intolerance and/or ineffectiveness were frequent. Low use of high-intensity statin found in this study also indicates gaps in the management of hyperlipidemia among patients with type 2 diabetes and possible remaining unaccounted lipid residual risk. Better management of these patients with diabetes is warranted to reduce their CVD risk. IMS Health. http://www.imshealth.com/deployedfiles/imshealth/Global/Content/Home%20Page%20Content/Real-World%20insights/IMS_Lifelink_pharmetrics_Plus.pdf (accessed 2 Mar 2015).
. Relative safety profiles of high dose statin regimens. Vasc Health Risk Manag 2008;4:525–33.
. Statin treatment patterns and clinical profile of patients with risk factors for coronary heart disease defined by National Cholesterol Education Program Adult Treatment Panel III. Curr Med Res Opin 2014;30:244–51.
. Understanding practice patterns and low-density lipoprotein cholesterol goal attainment implications of switching patients from simvastatin in a health plan setting. Am J Manag Care 2007;13(Suppl 10):S276–81. Centers for Disease Control and Prevention (CDC). National Health Report: leading causes of morbidity and mortality and associated behavioral risk and protective factors—United States, 2005–2013. MMWR Surveill Summ 2014;63:3–27. Contributors SRG and RGWQ participated in the design of the study, and provided data interpretation and critical review of the study results and manuscript. LW and LL participated in the design of the study, interpretation of data, drafting of the manuscript, and performed the statistical analysis. KMF and NDW participated in the study design, data interpretation, and critical review of the study results and manuscript. All authors read and approved the final manuscript. Funding This work was supported by Amgen Inc. Competing interests SRG and RGWQ are employees and stockholders of Amgen Inc. LW and LL are employees of STATinMED Research, which is a paid consultant to Amgen Inc. KMF is an employee of Strategic Healthcare Solutions, LLC, and is a paid consultant to Amgen Inc. NDW is a professor at the University of California, Irvine, and is a paid Amgen Inc consultant and advisory board participant. Data sharing statement Patient data were obtained from IMS LifeLink Pharmetrics Plus commercial claims database containing de-identified patient-level information.